In preparation to this session, Dr Westerside asked us to read two texts; from a book called “Postproduction” and from “The Postmodern”. One can’t start explaining what postmodern theatre is without mentioning what is postmodernism as an idea and what id modernism itself. And so did we. The session begun with defining what modernism is. It defines since the industrial revolution towards the future. There’s a big narrative that units to human race to move forward, there’s an abstract that brings to the core of truth. 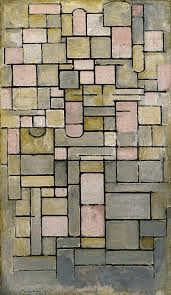 Dr Westerside gave as an example Mondrian’s Composition 8. Modernism is the digging towards originality, its drifting away from everything that came before it, it’s the change, the new, the innovation. Modernism is the contemporary expressed in artistic means. The modern artist must change with time, to explore, to wonder to initiate. Robert Rauschenberg on the other side, as a postmodern artist presenting mixed techniques, a mess, more of a process than a finished piece. Dr Westerside also mentioned le Corbusier famous quote:” a house is a machine for living in”. Well that’s modernism. Everything is functional and has a purpose. Postmodernism architecture is making a parody to other styles. The first strategy of postmodernism is eclecticism. Collecting similar ideas and re-edit them. Mixing ideas, subjects, issues, techniques and practises from different eras and cultures. It’s a Pastiche with no hierarchy, a field of strategies. 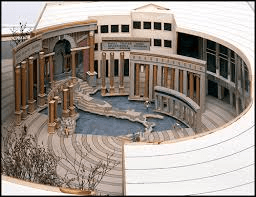 In architecture, if bauhouse represent everything functional and modern then Charles Moore’s Piazza d`Italia in New Orleans is the opposite. Its definition vs. taxonomy. A doubt about knowledge .absolute, centrality of the self, relativity, acknowledgment of the instability of a concept. A concept that belongs to other systems, perceptions and other wholes. It’s like a sea of marbles that keeps changing and moving. Then we watched the short film “Everything is a Remix” by Kirby Ferguson. (More on the video à http://everythingisaremix.info/ ) That video for me, is where art is going. Everything is a remix so we should remix it wisely. There are few other elements, beside eclecticism in postmodernism we didn’t mention in class. The first one is parody. The parody in that sense can be taken as a continuation to the eclecticism. If the eclecticism cancelled the hierarchies, collected and mixed the parody usually focus on one thing, one element, idea, text, and “rides” on that. Creating an impression, mocking it by exposing the side that so sure of itself in that element. A good example for that would be the Allen Memorial Art Museum in Oberlin, Ohio by the architecture Robert Venturi. The building combines few different styled without trying to make any connection between them. Another example for that id Cindy Sherman’s the untitled film stills series from the 7o’s. Sherman presented a series of classic photographs of herself (the usage of the word classic is also a parody on the language itself) that relates to the American cinema. It looks like a picture from an old Hollywood film as she imitate the photos her generation grew up with. She becomes the star of her own film but she is completely different from a photo to photo so there’s no narrative been built. By that she creates double parody. On classic Hollywood and on the attempt to create images that demands totality from the artist. Another elements of the postmodern art are lists, archives and categorization and simulacra. The listing, archives and categorization in postmodernism flatten everything. Nothing has meaning anymore. On Kawara works are exploring that starting from his “Today” series to “One Million Years” and more. Simulacra means that nothing have an origin it’s all a pile of quotation (what the video, everything is remix is claiming). The ongoing never ending copying making it impossible to define what is original and what is a copy. Andy Warhol is exploring that in his works. The reading was exactly what we discussed about in class and was a good preparation to be based on.